Caribou antlers or moose – the way they did it, they put it in lake water for a certain time, maybe a month…They took it out, and then next summer, same thing… That antler just become like ivory, even inside, [it became] harder. They treated it for [making] that arrow point. This Gwich’in arrow was made for small game such as ground squirrels, ptarmigan, and grouse but could even be effective against a moose or caribou if it struck the animal’s soft belly. 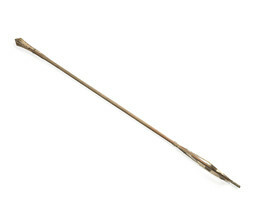 The arrow is fletched with hawk feathers and has a blunt point made from water-hardened antler. Red ocher, an iron mineral, was used to paint the zigzag lines. Phillip Arrow: What’s that [head]? Trimble Gilbert: Well, my story is going to be longer again [laughs]. This arrowhead, I’ve seen it lots of different ways they make it. And first thing I want to talk about is arrowhead. It takes a long time to treat it too. . . . Summertime is velvet’s on there. It’s pretty soft, we all know that. Aron Crowell: On the caribou antlers? Trimble Gilbert: Mm-hmm, caribou or moose. And then after that, velvet come off and then September is really hard, but inside is not hard yet. So the caribou antlers or moose, the way they do it, they put it in lake water for certain time, like maybe month. And then they took it out, and then next summer, same thing. Then maybe takes three years, then they do certain thing. They treat it and then that antler just become like ivory, even inside, harder. And then they treat it for that arrow point, like this. Aron Crowell: So the antler has to be hardened. Trimble Gilbert: Yes, harder, whole thing just become just like ivory. They treat it. They do it certain way, but I didn’t follow them, what they’re saying too much. I should have wrote it down. That point must be for a small animal. Judy Woods: Look like it. Trimble Gilbert: Like a ptarmigan. Trimble Gilbert: No, ducks is different. Ducks is two [see E178645B]. . . . This is for the small animal, but for moose or caribou, it’s real sharp, different shape. And also that flint. Flint is easy to make things out of it. And we got flint mountain in Arctic Village on the map, and northeast from Arctic, maybe seventy-five mile, that’s where the people getting flint from over Canada or Yukon Flats. And maybe your people might go up there too long time ago, when they come up to get that arrow point. I visit that place and up on the hill with archaeologist people. And when the people live out for the game, they sit around all day and that’s the time they work on arrowhead. So we found two, three of them just right on the dirt, and it’s really fancy one. So they used that flint too, and also the bone. So that’s popular place for the people to come long time to make the arrowheads. Trimble Gilbert: And for this [shaft], we use that spruce tree. I been using spruce tree up in my area. And this is a sinew right here [binding around fletching] and right here too [binding around arrow head]. Eliza Jones: This is tl’aah [sinew]. Trimble Gilbert: This is ch’ìh rii varàhnyaa [we just call it ch’ìh"], ch’ìh [moose or caribou backstrap]. (2) And dzii choh ("hawk") feather. Dzii choh are either other kind of hawk. Eliza Jones: The big feather, we call it t’on’ [large feather, leaf]. Trimble Gilbert: Mm-hmm. Even eagle feather is good too and eagle nesting, you always find a feather there. Eliza Jones: This has three. Trimble Gilbert: Mm-hmm. And that same color is maybe up to here [coloring on shaft under fletching], you know, that same color we talk about? Eliza Jones: Oh, that tseeyh [ocher]. Trimble Gilbert: Mm-hmm, that tsaih [ocher]. 2. According to Trimble Gilbert, ch’ìh “moose or caribou backstrap” was used for sewing. It was split into strands and twisted into sinew thread.